High performance set includes all the products you need full information about products below. Pre sports rub for cold and wet conditions, provides a cooling and warming sensation to the muscles. Aids in injury prevention and pain relief. Maximises warm up, training and/or post recovery. Application: This is a concentrated product so use only a small amount and massage into affected areas. 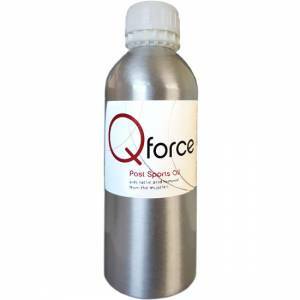 Can also be used with Qforce pre sports oil for muscle definition and extra stimulant intensifies your warm up training. Improves the mobility of joints in dampness or cold weather. Assists in the healing of sprains, strains and bruises. Quickens the healing process and protects while on going training is needed. Ideal first aid application. Soothes muscular and rheumatic pain when massaged into painful areas. Anointing Oil Founder and creator of Qoleum Anointing oil, Rebecca Day, has researched and formulated an exact reproduction of the Anointing oil that would have been used in the time of the old testament , her hope to see people become increasingly free through the power of prayer and Anointing. The ingredients are 100% natural and organic. Every bottle of Anointing oil is hand made to the exact formulation found in the scripture. Exodus 30:23-25 “also take for yourself quality spices, 500 shekels of liquid myrrh, half as much sweet smelling cinnamon (250 shekels), 250 shekels sweet calamus, 500 shekels cassia, according to the shekel of the sanctuary and a hin of olive oil, an ointment compounded according to the act of the perfumer. it shall be the Holy Anointing oil”. Directions for use: For healing and Pastoral care. Can be burnt pure to Sanctify/Bless/Purify the home from sickness, germs, toxins. Applied to body to heal, repair and soothe muscular aches and pains including phantom pains Used in combination with Qrub to maximize performance, recover faster while protecting the body from further injuries. 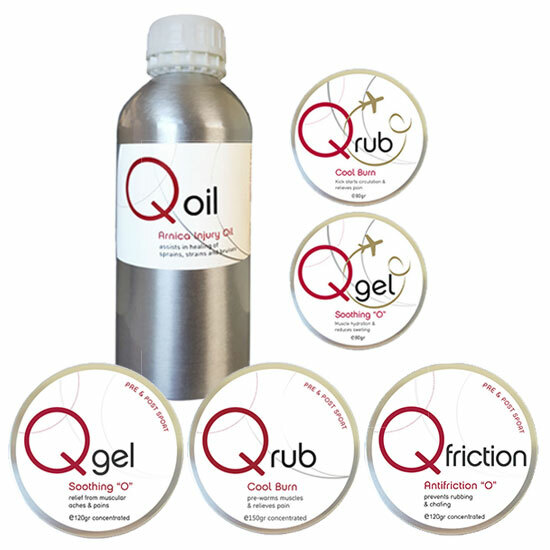 Flight Qrub 80g “Kicks starts circulation & relieves pain” By working on the exact needs of your body, kick starting and balancing circulation in limbs when flying, reducing muscle fatigue and preventing delayed on set muscles soreness and cramping. Anti-inflammatory, soothing, hydrating and calming properties. Flight QGel 80g “Muscle hydration & reduces swelling” Soothing Gel tunes into exact needs of your body, healing aches & pains in muscles, ligaments, tendons & joints. Improves circulation, reduces swelling, soothes tired aching, heavy stiff legs. Cooling sensation when applied to overheated muscles with calming, moisturising, hydrating properties. Mild soothing gel for all conditions and can be used at anytime. Cooling sensation when applied and acts on a time release for active oils to soak into painful areas. Can be used pre or post sports when muscles are hot and worked out. Facilitates relief of muscular aches and pains arthritis and rheumatism symptoms. Has healing and injury prevention qualities. Application: Apply to painful areas anytime of the day. Cooling sensation when applied and acts on time release for active oils to soak into painful areas. Antifriction ointment prevents friction and rubbing from sports kit and equipment. Also facilitates in the prevention of saddle sores, chafing and associated infections, with anti-sweat properties suitable for face use and above eyebrows and prevents blisters on hands. Application: Apply to affected areas of the body, and/or directly onto chamois of cycling shorts, or apply to skin underneath sports equipment. Antifriction ointment prevents friction, chafing from the body and rubbing from sports kit and equipment and clothing. Water based sports used to prevent blisters only small amount needed and will not loose grip. Children can use in swimming pool as a protective barrier against the chlorine irritating they skin. Perfect solution for Linemen especially to prevent irritation, chafing, skin rubbing, underarms, Trapezius, thighs and under equipment. 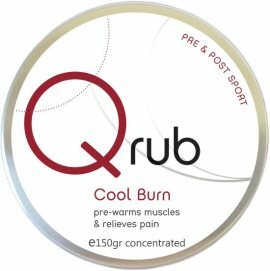 Rub into affected areas, can also be used with QForce Pre sports oil for muscles definition and extract stimulant intensifies warm up. For aches and pains apply 3 x day. Extreme sports in either extreme heat or Arctic condition contact for exact usage guide Do not apply to open wounds. This is a topical application. Apply and massage into affected areas, for Children apply over bruised areas Do not apply to open wounds. This is a topical application. For Churches/Pastoral care apply through Anointing and or can be burnt pure over a tealight in a oil burner only a small amount is needed. Apply to areas of discomfort lower back, neck, feet before, during & after flying. If combined with Flight QGel apply before and at end of flight. Apply to area feet ankles legs & wrists before, during and after flying to prevent/ reduce swelling. If combined with Flight Qrub apply before flight, middle of the flight. Apply to areas of discomfort, aches & pains, swelling & after sun. For athletes apply directly after training or competition to muscle groups. Extreme sports in either extreme heat or Arctic conditions contact for exact usage guide. Do not apply to open wounds. This is a topical application. Apply directly to the skin on affected areas for prevention or repair. Can be applied to face, above eyebrows to prevent sweat. For Children acts as a barrier age against chlorine/sea water then apply over the area of eczema/psoriasis only small amount is needed. For amputees wearing prosthetics apply to stump and areas wear prosthetic is attached. Do not apply on open deep wounds. This is a topical application. Will not damage Neoprene/wetsuits/compression fabrics. Only the finest ingredients are blended together 100% natural, organically grown, Certified organic USDA, Certified organic Bio gro.